So I've decided that I want a black basic tote bag. It's either going to be a Prada Saffiano Lux tote in black or a Michael Kors medium Hamilton bag in black with gold hardware (because I saw one of my favorite bloggers, For the Love of Retail, get one and it made me realize how nice and affordable it was). 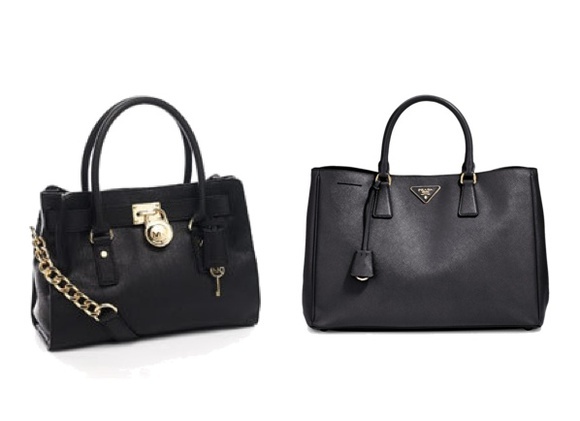 The Prada Saffiano Lux tote is pricier at about $1900 CAD and the specs can be found here at the Saks Fifth Avenue website. The Michael Kors Hamilton bag is 20% of the price of Prada for about $350 CAD and the specs could be found here on their official website. The Michael Kors bag is actually really reasonable in price and is pretty. But the Prada is...well Prada and I like the Saffiano textured leather. The Prada one I could use when I'm older in the future and it looks super professional. The Michael Kors one isn't as professional looking and it's just a good basic black bag at the moment (maybe not forever). Which one do you think is nicer? Unfortunately, money may be a deciding factor if I get accepted to the full time program I want to attend for September 2012. I will be paying for my own tuition this time around. But if there's a will, then there's a smart and economical way around getting the Prada right? - i.e sell something I don't use/need. Prada hands down. Much classier than the MK. And Prada will last longer. Much longer. I like the Hamilton but if you're only going to get one black tote, Prada all the way! It's more of a classic which you could theoretically use when you're wayyyy older. The chain/lock detailing on the Michael Kors are kind of a "younger" look, IMO. hey thanks guys. yeah i want the prada one the most. also that's my exact thoughts! - the chain and lock makes the bag look younger. Prada! I have the Hamilton in the tan color and it's nice and decent quality for what you pay for. However, Prada you can carry forever and MK is def. young. I hope you get the Prada! It's so classic and will stick with you forever and can even be passed down! I'm not super keen on the chain detailing of the MK bag. I'd pick the Prada in a heartbeat. I probably won't be putting a laptop in the prada bag because I'm scared I'll warp the sides/corners. I actually like the chain detaling of the MK bag. Maybe if I don't get the MK bag in black, I could get it in that tan cognac colour lol...but this is just fueling my handbag obsession. I gotta stay focus on a classic black bag. My mom has that exact same prada bag but in a beautiful beige color! The black keeps the bag young and versatile enough for you to grow into when you're older because it's such a classic piece. while the price is a lot higher than the MK bag, you will be using this bag a lot longer and the MK bag isn't out of the same high quality material. If money is the problem at the moment, I suggest to save up slowly rather than getting the MK bag right now. It's a lovely bag! Ah. I've been thinking about getting a similar type style of bag too (since the zipper of the one I was previously using...broke. T_T) I do like the MK one a lot! The chain seals the deal for me. lauren - oh gosh beige would look so nice as well. i kind of want a beige one as well. i guess majority sides with what i intended to buy. i'll probably look into in march when i go to new york or in february when i think that's when they have the holt renfrew gift card promo again. tiffyama - the MK bag is too cute tho! i think i still want it as well =) In the states it's pretty cheap $299. Have you seen Mission Impossible: Ghost Protocol? Lea Seydoux carries that bag and seriously when I first saw it, i leaned over to my boyfriend and said "I NEED that bag" So obviously the Prada gets my vote! maria - that's such a nice school bag! maybe i should just get both... LOL.... i think i'll get the medium. i think the large is too large for me on a regular basis. maddy - yes! i saw that movie on opening day and i noticed that bag right away too. i was thinking: "it must look just as good in black"
I am wondering which one you bought? I am 45 and bought the large Hamilton Tote in Cadet. I commute via train 4 hrs daily and travel alot. I wanted something I could put files in and I liked the versatility of shoulder straps but nice enough to use the handles. Hands down I would get Prada if I had the money. I can't ever see using a Prada bag as an everyday bag. Also, I believe you need to be careful of bringing a Prada bag into the workplace because of coworkers unless many like fashion. I love the prada bag pictured and want it, too! But, the best bag for me now was the MK. I like the michael kors black one! Cus michae kors bags are looks fashionable!